One situation that has flown largely under the national radar is that of the unprecedented attacks on local democracy by the governor of Michigan. 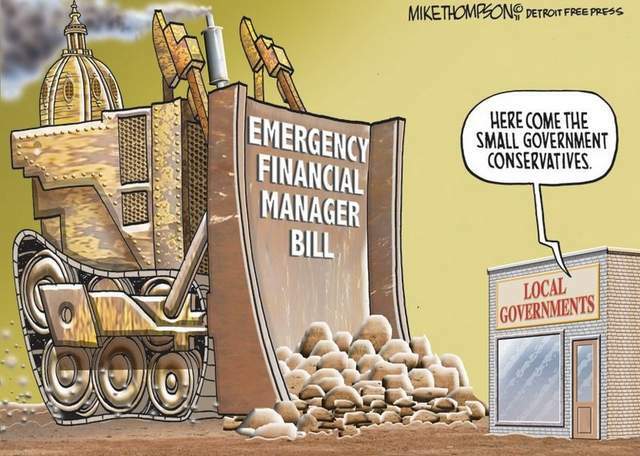 The 2011 expansion of the assigning of “Emergency Financial Managers” by Governor Snyder has led to a near complete degradation of local democracy in some locales MI. The basic premise of an emergency financial manager is that where there is a severe budget deficit or financial emergency, an emergency manager can be put in charge of a city, town, or school district. In the past, emergency managers have been appointed over school districts and given broad discretionary powers to control spending; in 2011, the Snyder administration massively expanded the powers and reach of emergency managers, while reducing oversight, accountability, and the requirements for a locale to be put under financial martial law. Under the new financial martial law legislation, an “emergency financial manager” can be appointed over any locale which is declared to be in a state of “financial emergency”; a very wide distinction that could be as simple as a single year where there is a substantial budget deficit. The emergency financial manager has broad powers yet virtually no accountability. They have the ability to relieve elected/appointed officials from duty, cut programs, summarily dissolve contracts between the state and other entities (unions, pensions, etc.) and sell off publicly owned goods to private entities. In compensation for their work, emergency managers are paid up to several hundred thousand dollars a year, something that is odd considering the fact that they are paid by “struggling” areas in need of emergency management. These managers are appointed by the executive branch of the state, thus are not elected or accountable to the citizens of the state; they have no conflict of interest rules, nor are they accountable to any state or federal agency. Perhaps the best characterization of the entire Michigan financial manager situation was stated by Lou Scimmel, emergency manager of Pontiac: When asked whether the EFM law in Michigan appointed tyrants over the population in an interview with local media, Schimmel answered “I guess I’m the ‘tyrant’ in Pontiac then if that’s the way it is”. Regardless of whether a financial manager can improve a city’s financial status, the fact remains that the state government has taken virtually all power from local elected officials. Apparently, with the entire furor over the White House “czars” (a media created moniker for policy advisors), the public has missed out on the fact that Snyder has begun appointing literal Czars over MI cities. A Czar was an unelected bureaucrat given virtually absolute power over a locale in pre-USSR Russia; an emergency financial manager is merely a Czar under a different name and in a different country. The primary problem with the appointment of EFMs over cities is that they destroy the entire idea of democracy wherever they are appointed. Local elections are absolutely meaningless in the face of an emergency manager; elected officials have their decision making powers revoked and are sometimes summarily dismissed. The destruction of democracy is purely Un-American and creates massive disenfranchised areas. Democracy may be inconvenient and slow to work, but governance by dictate, as has been instituted here, is not consistent with American values. As poorer areas are more likely to suffer budget issues, thus are more likely to be taken over, the poor are disproportionately disenfranchised. By virtue of living in a poor neighborhood large swathes of the MI population have control over their city taken away. Cities such as Pontiac, Flint, and Benton Harbor are currently under the control of emergency managers; these cities are all majority poor, but they are also majority ethnic minority, demonstrating the situation where black Americans have suddenly lost a great deal of power in MI elections. Detroit could potentially be put under financial martial law during early 2012 and if this happens, 51% of all black Americans in MI would be under emergency management. Regardless of whether this racial disenfranchisement is intended or not, it is imminent and discriminatory in an unacceptable manner. A secondary, but vital issue is that emergency managers can be used to push an ideological agenda against the will of the people. Emergency managers can unaccountably cut pensions, nullify union contracts, defund local programs, and sell public goods into privatization; as most of these policies are unpopular with the public, officials who want to push this agenda must weigh their views against the electoral backlash. Emergency managers are appointed, not elected, thus they can do unpopular things without worrying about public opinion. After all, why would the “Tyrant of Pontiac” worry about the little people whose union contract he destroys, health benefit he cuts, or schools he closes. He gets paid regardless of public outrage, and better yet, the guy who appointed him is shielded from backlash. As the governor appoints these managers, he can use them to do unpopular thing without dirtying his hands. Do we live in a country where our elected officials can appoint local dictators and nullify our votes in certain elections? No, we live in the USA, where democracy is supposed to decide public policy and officials. Dictatorship is un-American and cannot be tolerated no matter whether the dictator agrees with you or not; next time, when power swings, the appointed Czar may not be so agreeable and there will be nothing you can do to stop him. Currently, the Michigan Financial Manager law is scheduled to be voted on in a state referendum on the 2012 ballot. If it is overturned, this terrible situation will be remedied and it is imperative that all people who are able to vote on this issue do so to preserve democracy.